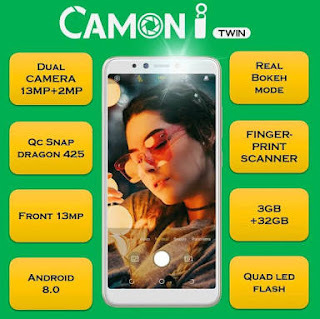 Tecno Mobile has launched a new smartphone called "Camon I Twin" and it features a 6-inch HD+ display with a screen resolution at 1440 x 720 pixels. The display comes with a 2.5D curved glass and bears an aspect ratio of 18:9. It is powered by a 1.4GHz quad-core Qualcomm Snapdragon 425 processor. Tecno Camon I Twin has 3GB of RAM and 32GB internal memory with support for MicroSd Card upto 128GB external. The phone runs on Android 8.1 (Oreo) out of the box with the company’s own HiOS to customize it. 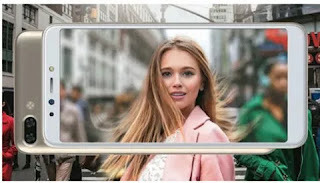 In Photography, there is a 13-megapixel rear camera with Quad LED flash which delivers enough luminaries to light up the dark scenes along with a 2MP AI portrait shots. 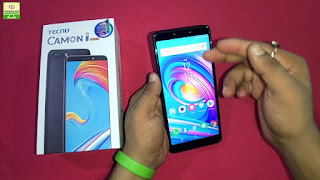 As it's the custom with Tecno Phones in the Camon Series, the company pays much attention in the camera features more than any other series from the brand. For selfies, there is a 13-megapixel front camera with LED flash and AI beauty as well. Just beside the rear camera is a fingerprint sensor for faster phones unlocking and security. The Camon I Twin has a dedicated dual SIM and microSD slots and packs a 4000mAh battery to keep the device functional. This is better than what Tecno Camon I offers. Find below specs sheet for more information. The Camon I Twin is officially available for purchase and you can buy it from any accredited tecno stores close to you or via online stores such as Slot, Jumia, Konga, Gearbest etc. ✔️ Tecno Camon CX and many more.